You know where the best donuts and best pizzas are in every 'hood in Chicago, but ice cream? Ice cream is still a complete and udder (!) mystery. 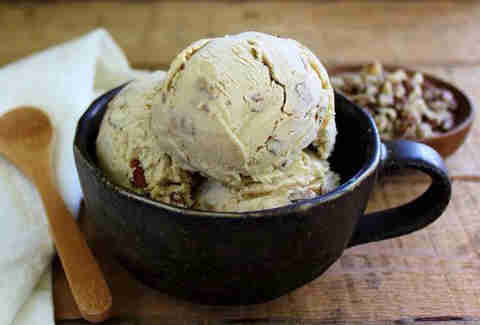 Luckily, we've got you covered: here's the scoop (!!) 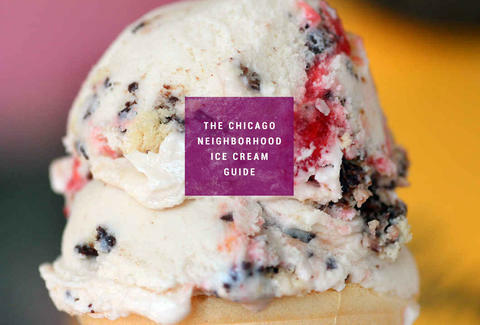 on the top ice cream shops in 17 Chicago 'hoods, for the next time you're wandering around sweating. 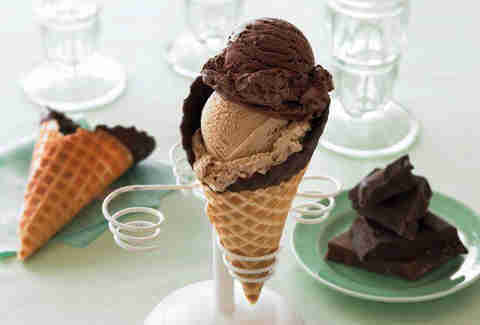 From old-school malts and floats to new-school scoops like Horchata and Fat Elvis (banana ice cream with peanut butter ripple and liquid chocolate chips) served in pretzel-encrusted cones, George’s is Andersonville’s go-to ice creamery and home to maybe the intense-est shake in Chicago: the Hocus Pocus, which's made with rainbow sherbet and POP ROCKS. This Mexican scoop shop does unique, South-of-the-border-inspired ice cream, with flavors like avocado and tequila. We tried them all, and the real gem is the gansitos, a blend of vanilla ice cream and chocolate-covered, strawberry & cream-filled snack cakes. 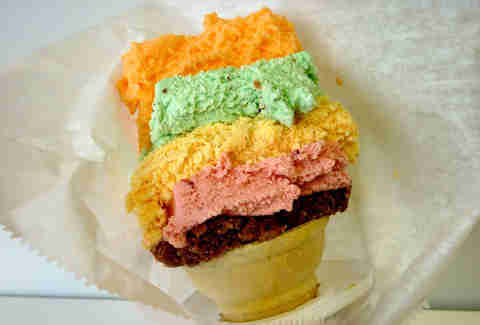 If ice cream flavors were food groups, you’d find a well-balanced meal in the Rainbow Cone from this Chicago institution. The iconic dessert is stacked high with scoops of chocolate, strawberry, Palmer House (New York vanilla with cherries and walnuts), pistachio, and orange sherbet. Fortunately (or unfortunately?) though, it tastes nothing like those a-little-bit-of-everything soda machine “suicides” you concocted as a kid. Because sometimes, adding ice cream and hot fudge to deep-fried carnival fare is just the right thing to do, Sugar Shack'll make your childhood county fair dreams come true with Funnel Cake Sundaes. If that doesn't make it the best ice cream shop in the neighborhood, nothing will. Experimental ice cream-eater? 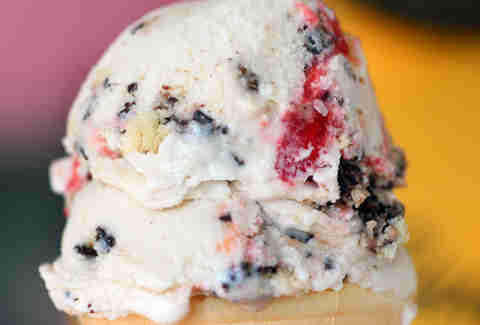 You'll love the wide range of small-batch, house-made flavors at Shawn Michelle's Old Fashioned Ice Cream in Roseland, including "Banana Bread Pudding" and "Caribbean Sunbeam Supreme". A '50s-style sweet shop shelling out pastries, cupcakes, and candy, Lickity Split custard comes in many forms. There’s custard shakes (toppings of your choice), concretes like the OMG (blended with peanut butter fudge brownies), and sundaes like the Scarlets Last Fall, a red velvet cake bowl with marshmallow sauce, raspberries, and whipped cream. Cap off a fast-food run of hot dogs and jalapeño poppers with whatever avalanche sundae is on tap (past soft-serve specials have included peanut butter chip, s’mores, and chocolate brownie). 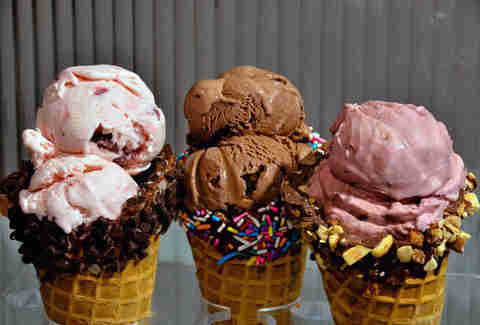 They also boast 30+ milkshake flavors, including peppermint patty and tiramisu. 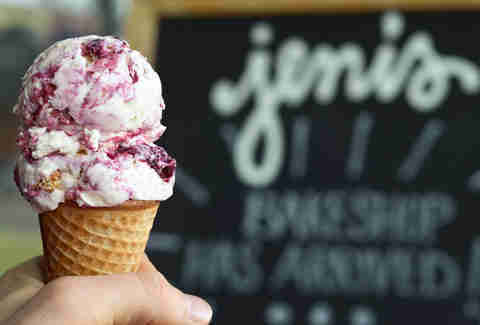 Lakeview is a veritable goldmine for great ice cream (Oberweis, Bobtail, Anthony’s Homemade Italian Ice), but ever since Jeni’s Southport came to town last Summer, it's been hard to imagine life without "brambleberry" crisp. The shop offers a mix of mainstay flavors and seasonal specials, as well as a small selection of unique French macaron ice cream. Okay, so it’s not exclusively an ice cream shop, but Armitage Ave’s premier burger vendor is home to some pretty killer milkshakes and custard, and for that reason, has earned our top Lincoln Park spot. Follow up a house-blend beef burger with a cone to-go. Or vice versa. This traditional ice cream parlor has served homemade sundaes and splits, hand-spun shakes, and hand-dipped candies to Chicago’s North Side for a long time (long enough that Al Capone, The Beatles, and Bruce Springsteen have all been there). 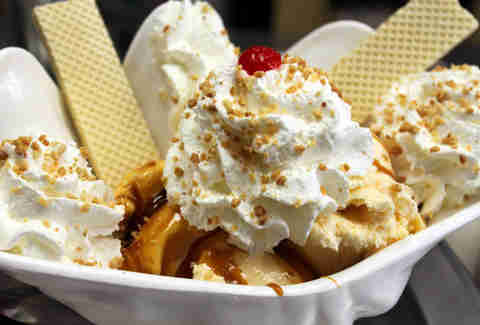 The space has changed little since it opened, and the vintage atmosphere enhances the experience of settling into one of the old, vinyl booths and chowing down on a three-scooper hot fudge banana split loaded with whipped cream, nuts, a cherry, and an old-fashioned wafer cookie. The high-end American restaurant in the heart of the Loop, sharing space with the restored Hotel Burnham, has a knack for desserts. On the sweets menu you’ll find bacon-glazed root beer donuts, caramel-salted cheesecake with Guinness syrup, and a rotation of gelato and sorbets. Your one-stop shop for all your chili, sandwich, and ice cream needs, Lindy’s and Gertie’s is the oldest (103-years-young) ice cream shop on our list. Cozy up with a hot bowl of Lindy’s famous chili, then cool your palate down with a Green River float, a brownie sundae, and a “triple rich” marshmallow float. Conveniently located across the way from the Hershey’s shop (a little healthy competition never hurt anyone, right? ), this premium, SF-based chocolate company goes beyond the candy bar wrapper with gourmet frozen offerings fit for the Downtown shopping crowd. Splurge on a bowl of robustly flavored espresso ice cream drenched in dark chocolate fudge, and wash it down with a mug of sea salt hot chocolate for an always-necessary pick-me-up. Regarded as Chicago’s oldest frozen custard shop, this family-owned destination hits the mark with its Blizzard-like concretes featuring homemade custard and a variety of mix-ins. The Coconut Cream Pie blended with graham cracker piecrust is a dead-ringer for the real-deal, and The Strawberry is loaded with hand-mixed fresh strawberry toppings. 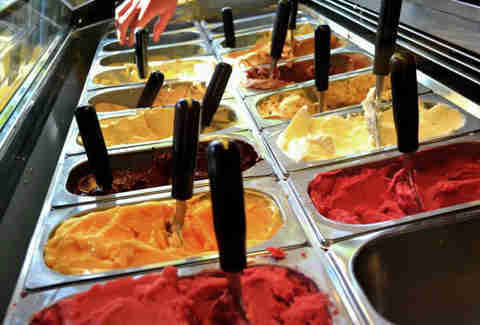 Whether you prefer your gelato in a cup, cone, or sandwiched between sides of a fresh, maple-bacon Glazed and Infused donut, Black Dog Gelato -- in all its manifestations -- is the answer to all of your problems. There's nothing that three scoops of blackberry French toast or a bucket of goat cheese caramel cashew gelato won't make better. Your soft-serve addiction started with the self-serve machine in your college dining hall. 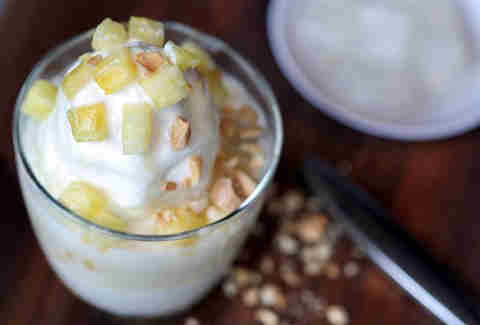 But your grown-up palate will appreciate the more sophisticated take at this Korean barbecue spot, where vanilla soft-serve is topped with either huckleberries and lime-basil seed, or passion fruit and cubes of young coconut jelly. Cubes. Jelly. Yes. 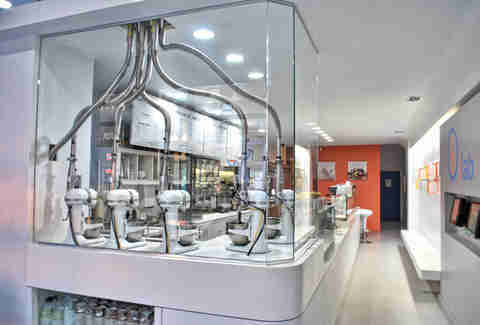 Get in touch with your inner-mad scientist at this futuristic ice cream shop, where you choose from six liquid bases (ice cream, milkshake, low-fat yogurt, etc. ), a variety of sweeteners, and more than 30 flavors. Once your concoction is prepared, watch it transform into ice cream right before your eyes, thanks to an industrial stand mixer outfitted with a state-of-the-art liquid nitrogen tank. Kailley Lindman is a contributing writer for Thrillist Chicago and Sean Cooley is Thrillist's Chicago Editor. Both of them are surprised there isn't an ice cream Segway tour yet. Help 'em start on Twitter @KailleysKitchen and @SeanCooley.